Express your deepest feelings of love and admiration with cute and cuddly range of Teddy Bears and other soft toys. Every color holds a different meaning altogether. Pick your choice to depict your affection and send Valentine Teddy Bears online to someone you adore. Buy now! 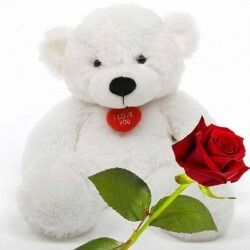 Teddy Day is celebrated on February 10 as a part of the Valentine Week to show love in the most expressive manner. This day is perfect to flaunt your love to someone you adore by gifting her a cute and charming Teddy Bear. Available in distinct sizes viz. 6, 10, 12, 15, 24 inches, to name a few, Teddy Bears exhibit a warm and gentle energy which is contagious. On the special occasion of Teddy Day 2019, send your love in the form of huggable Teddy Bears. We have a plethora of Teddy Bears online along with our other Soft Toys online for Valentines Day. Having a wide selection of Valentine Teddy Bears online, pick the one that will best surprise your love. When you are away from your loved one, you can make their day special by sending them huggable Teddy Bears online from our online gift store. When you are looking for sweet gifts for your girlfriend on Teddy Day, Teddy Bears make for the perfect gifts. 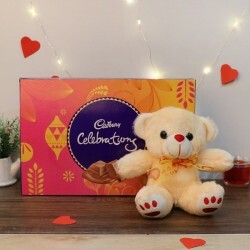 And what better place to order Teddy Day gifts 2019 than MyFlowerTree! Right from 18 inches tall Teddy, Soft Hugger, 3 feet tall soft Teddy Bear, Teddy 15 inches tall, My Friend Teddy Pink, Jumbo Harry Bear, Grey Hanging Elephant, Dual Teddy, we have wide-ranging gifts for the woman in your life. Our adorable Teddy Combos include Tender Ardor, Teddy Chocolate Bouquet, Tender Surprise, The Cardinal Hamper, Benign Couple, Hugging Monkeys, Cage Of Love, Blue Teddy with Towel, Benevolent Love, The Golden Glow, Sweet Gestures, Trendy Trio Bouquet, Teddy n Helium Balloon, Teddy Madness, Together Forever, Love Hamper, Soft and Crunchy, Lucky Sister, Hugs and Kisses, Dose of Softness, Delicate Touch, to name a few. If you do not wish to send Teddy bears on this special day, we also give you the option to send from among our other soft toys available at our online gift shop. These include Love Pack, Soft and Sweet, Luxury Heart of Roses, Smile for the Pirate, Karate Special, Minion Celebration Pack, Pirate and Candles, Nutty Pirate Hamper, Naughty and Nice Hamper, Hawaiian Drift, Pop it Minion, Kids Special, Pirate Hamper, Minion with Chips, Take a Break Hamper, Pirate Minion Toy, Inspirational Minion, Hula Hula Hamper, Hawaiian Beats Hamper, Ferrero Rocher and Minion Combo, Crazy Minion Toy, Ahoy Hamper, Artistic Minion, Aloha Minion Toy, Heart Shape Pillow, and so much more. From a gamut of options available online with us, book charming Teddy Bears for 10 February to someone you love and let them cherish the moments of surprise you plan for them. Room Full of Teddies - Fill her day with a delightful cheer by sending this adorable gift of 8 to 10 Teddy bears of varied sizes of 6, 10, 12, 15 and 24 inches. Smile with Teddy - Gift this artistically arranged bouquet of 9 little Teddy bears to demonstrate your love. Teddies Around Her - Hug her soul with 8 to 10 assorted Teddy Bears by choosing this one. Teddy Hug - Send this charming gift of 3 cute Teddy Bears arranged in a basket to lure your special one. Cuddles, cuddles and more cuddles! Yes, it’s the perfect season to send some affectionate and love-filled cuddles to the one you really adore and love. Mushy romance and pampering moments are the calls of this season of love, Valentine’s day week. 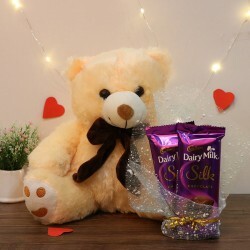 Teddy day marks as one of the most special days of Valentine week when you should gift a nice teddy bear to your dear girlfriend so that she can hug it tightly whenever she misses you. Our teddy bears are so cute that she will fall in love with it almost instantly. MyFlowerTree offers you an extensive collection of lovely teddy bears along with the enticing floral hampers, delicious cakes, and heart touching gift items. If you are really planning to do something really special on this Teddy day, our exceptional delivery features can help you in the best ways. Wondering how? You can send a lovely teddy gift combo to your sweetheart at the middle of the night by opting for our midnight cake delivery service. Another awesome delivery feature offered by us is the same day flower delivery which ensures your gift will be delivered the mentioned address within the same day itself.